Bees around a sunflower. 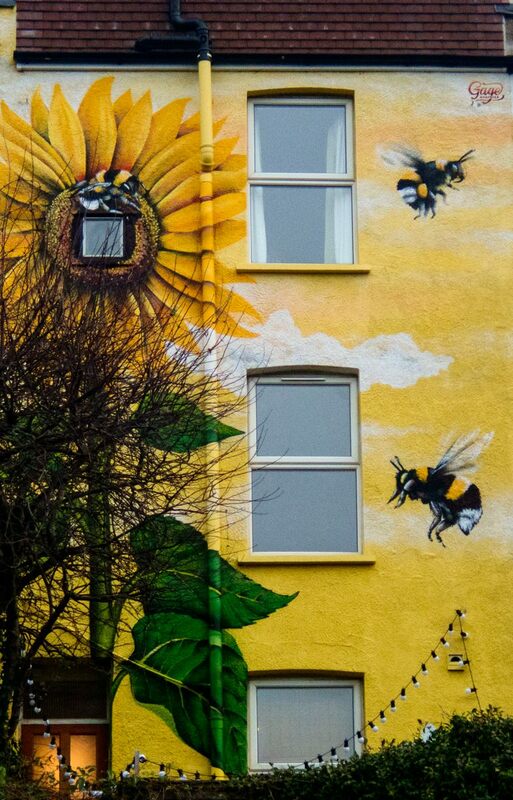 And – unseen – imaginative south Bristol inhabitants. There are earlier Modern Housing posts here: 1 2 3 4 5 6 7 8 . Each will open in a separate window. The first image in the Outer Suburbs series, with context, is here: 1 . Subsequent images are here: 2 3 4 5 6 7 8 9 10 11 12 13 14 15 16 17 18 19 20 21 22 23 24 25 26 27 28 29 30 31 32 33 34 35 36 37 38 39 40 41 42 43 44 45 46 47 48 49 50 51 52 53 54 53a 55 56 57 58 59 60 61 62 63 64 65 66 . Each will open in a separate window. Click onto the image to open another version in a separate window, and click onto that image to enlarge it further. Technique: TG-5 at 100mm (equiv); 800 ISO; Lightroom, using the Camera Vivid film simulation; south Bristol; 29 Jan 2019. 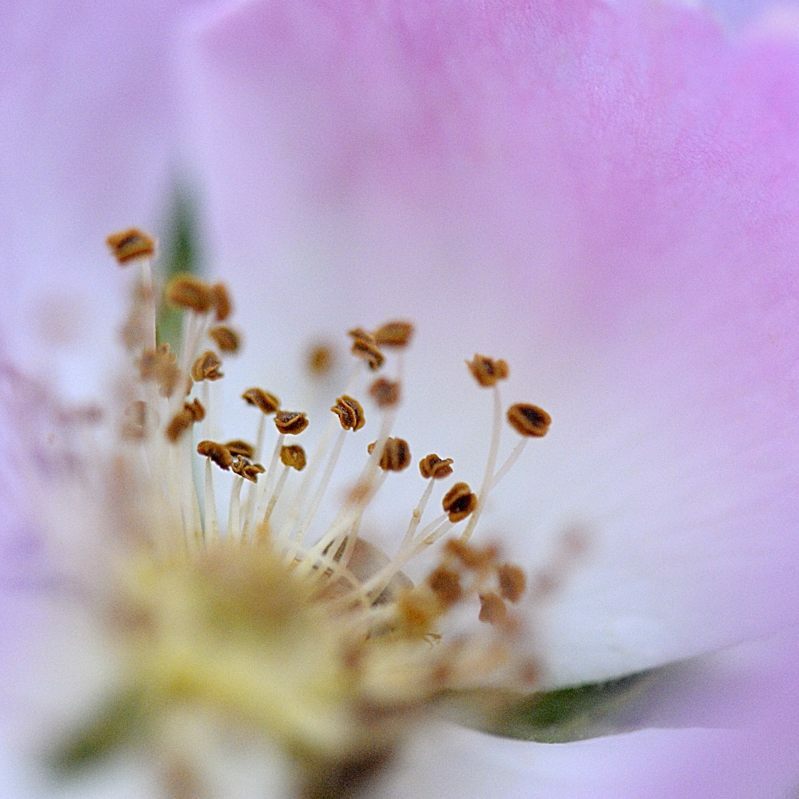 Inside the flower of a Dog Rose. I ought to know what the tall structures are but, as I firmly bade farewell to studying anything botanical in 1968, I’m unsure. Stamens maybe? ….. I’m more sure of one who will know the answer …. wonder who that can be??? …….. ? Getting away from reality – oh, that’s better!!! …. 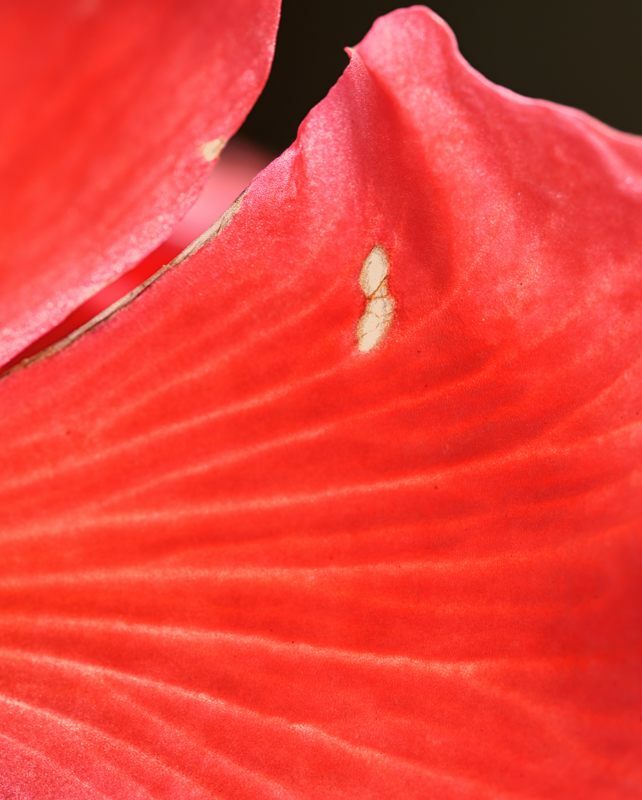 – the blurred dark element almost reaching the lower right corner, and a similar dark object diametrically across the flower’s centre, look like slim, beating wings. And the blurred, slightly greenish “thing”(!) in the lower left corner might be a beak – so is this some exotic bird in flight, with bizarre and erect plumes on its back? The rose’s petals are pale, and serve as a diffuse backdrop. Click onto the image to open another version in a separate window, and click onto that image to enlarge it. Technique: D700 with 105mm Nikkor lens; 6400 ISO; our back garden, Bristol; 24 June 2013. The year ages, winter looms, and Life dies back, beds down, readying itself for the months of cold and darkness ahead. 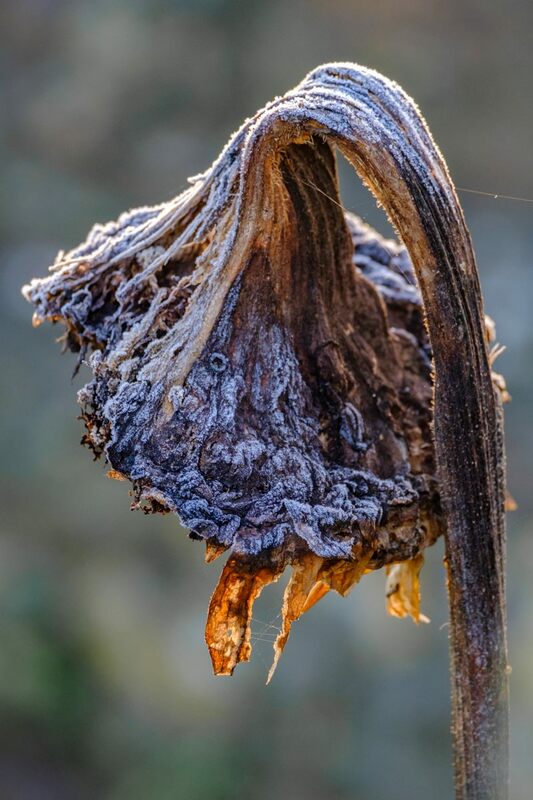 Dead sunflower, heavily frosted, in the back garden of the farm next to the church in Stanton Drew. Technique: X-T2 with 55-200 Fujinon lens at 305mm (equiv); 3200 ISO; Lightroom, using the Velvia/Vivid film simulation; Stanton Drew; 6 Nov 2017. Click onto the image to open a larger version in a separate window, and click onto it again to further enlarge it. Technique: X-T2 with 55-200 Fujinon lens at 305mm (equiv); 1600 ISO; Lightroom, using the Classic Chrome film simulation; Capture NX2; Silver Efex Pro 2, starting at the Film Noir 1 preset, selectively restoring colour and adding a tone and black border; York Place, Clifton, Bristol; 21 Apr 2017. Another look in through the windows of this restaurant, the first look being here; 14 July 2016. In this case, something easier to compose with, albeit that hard reality may be in short supply. And that flower in the shadows at top right is not looking at you. Click onto the image to open a larger version in a separate window – recommended. There is a third restaurant interior here. X-T1 with 55-200 Fujinon lens at 305mm (equiv); 3200 ISO. 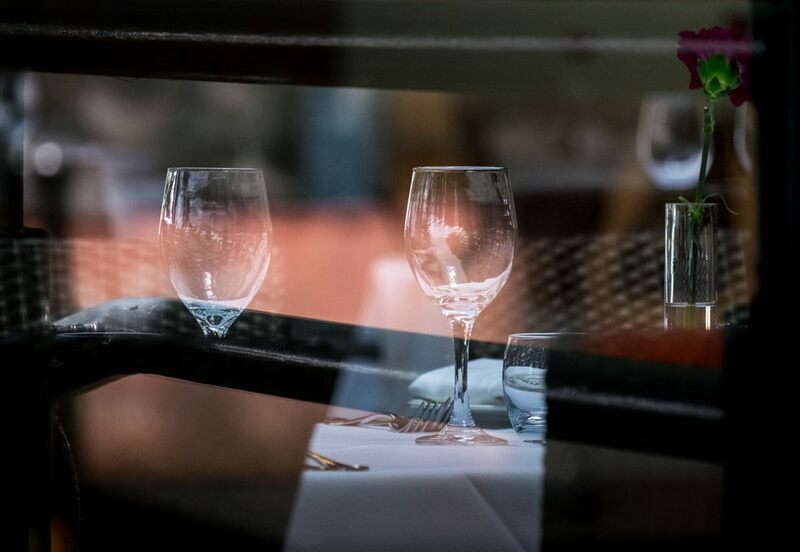 Looking in through a restaurant window, Bristol Harbourside; 14 July 2016. 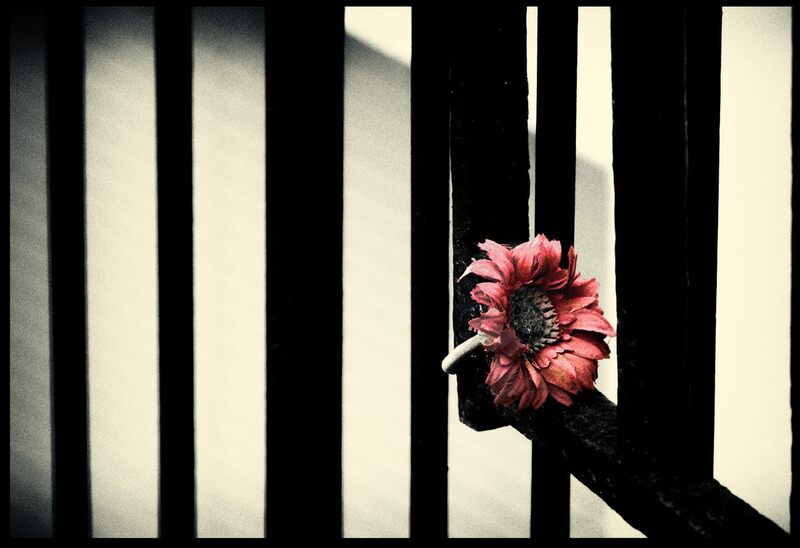 Looking in through this window, I was at once taken with the single, beautiful flower, caught by the light. But, there being all sorts of visual rubbish off to the left, I could not make the flower anywhere near central in the composition, nor get it near to any of the compositional thirds. I could of course have tried portrait (ie vertical) format, but this seemed a waste of all that diffuse, half-seen, “restauranty” detail off to the right – table cloths, more glasses, cutlery, upholstery. And so to this. Westerners’ eyes often enter images from the left, perhaps because we write from left to right – I’ve often talked about this on this blog in the past. 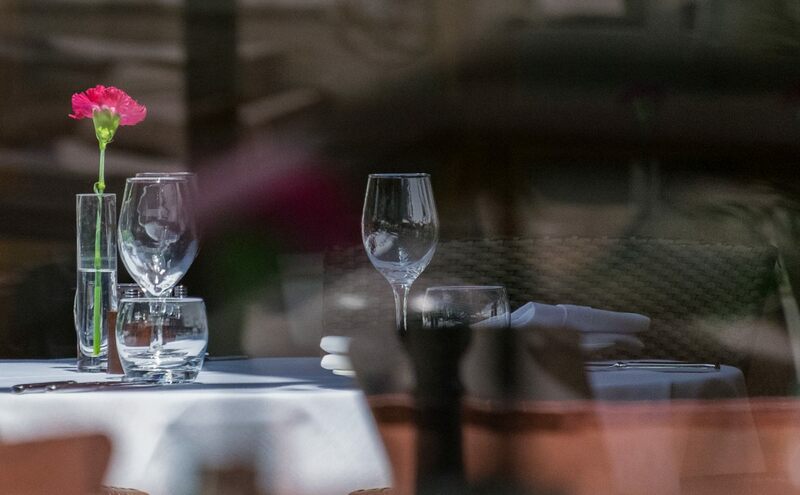 So, in this case, my eyes enter this image from the left and run visually slap bang into the flower and its attendant glassware, sharp and well lit in the summer sunlight – and are for a moment held there. But as I look at the bloom and its reflective attendants, my eyes keep wandering off to the right, wondering what’s there – only to be dragged back to the flower again. Do your eyes do the same, or do you see this differently? Is the flower really too far left? What do you think? Click onto the image to open a larger version in a separate window. 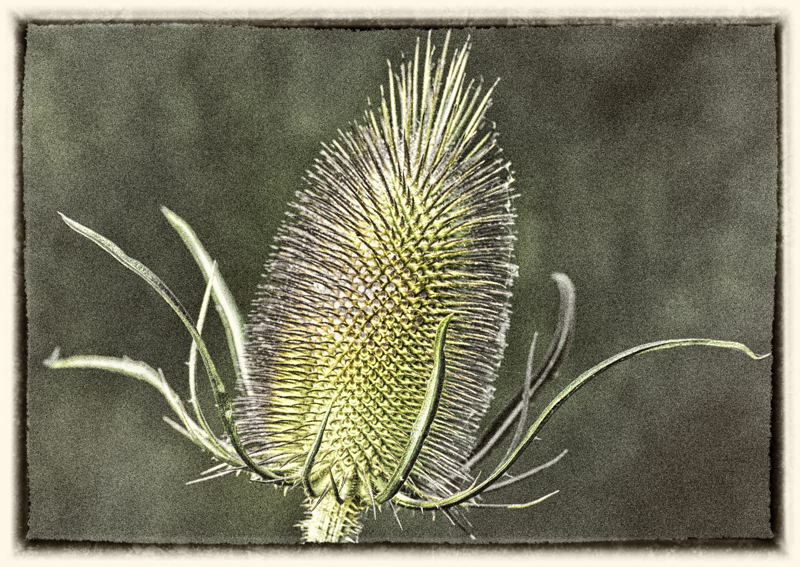 Teazel along Tripps Drove; Godney Moor, on the Somerset Levels; 26 Jul 2012. I don’t take many pictures of flowers, but early one peaceful and gorgeous morning along Tripps Drove I saw these Teazels beside a water-filled ditch – just before, my attention distracted, a horsefly had his fill from me. And here, for once, I’ve given SEP2 its head and followed where it led – the Yellowed 2 preset looked good and here it is border and all, along with some minor adjustments, and also extensive restoration of colour. D700 with 70-300 Nikkor at 270mm; 400 ISO; converted to mono and re-coloured using Silver Efex Pro 2. Windblown poppy; Newquay, Cornwall; 11 Sept 2013. I like Newquay. It is cheap, tatty and unpretentious, and there are so many establishments offering Full English Breakfasts that I could probably stay there for a whole month and eat in a different one each day. That said, I have the strong suspicion that most of these repasts would be of the pallid and rather tasteless variety but, still, anywhere with this number of breakfasts on offer can’t be all bad. And, with its famous Fistral Beach facing out into the Atlantic’s rollers, this little town is a mecca for UK surfers – as well as being the pub, nightclub and “booze / drug yourself silly” capital of the west for youngsters intent upon a good time that they may not remember too much about. We had a couple of dry days on our short break, but the westerly wind blew throughout and the great white waves smashed into the cliffs and headlands – not that we are in any way surfers, mind! For a start I can’t swim, and neither of us are at all into such energetic activities. There was a ragged flowerbed in front of some kind of religious building sandwiched in between the Houses Of Hedonism along the main drag, and the gusting westerly was sending the flowers in all directions. 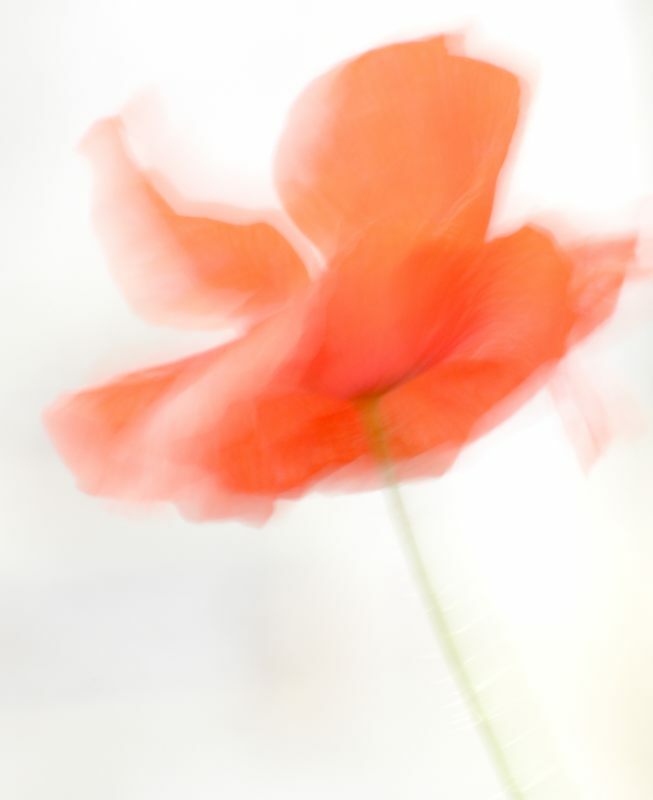 The waving poppies stood out from the rest, and a quarter of a second at F29 gave this pale and Impressionistic result. D800 with 70-300 Nikkor at 300mm; 400 ISO. Dying flower; 25 Aug 2015. My wife grows flowers in pots outside our front door and I like these big splashes of colour. But, an English “summer”, and now a month with an “r” in it – and there are many more of those to come, right through to April. And so wind and rain tore off a large bloom and left it, wilting fast, on our front path. And so to carrying the dying thing indoors and putting it on the table. Whereupon all sorts of very much alive wildlife appeared from out of its folds, only to march off with far more purpose than I can usually muster. And so to looking at this riot of colour and setting up a camera, to produce a picture of something transient; something that was once like this but that is changing fast. And emotions? Well, sadness at the universality of the transience I suppose, but also great joy at the many forms that Life can attain while it is up and running. Many things in this world are boring, but Life will never be one of them. D800 with 105mm Nikkor; tripod; 100 ISO; Color Efex Pro 4. 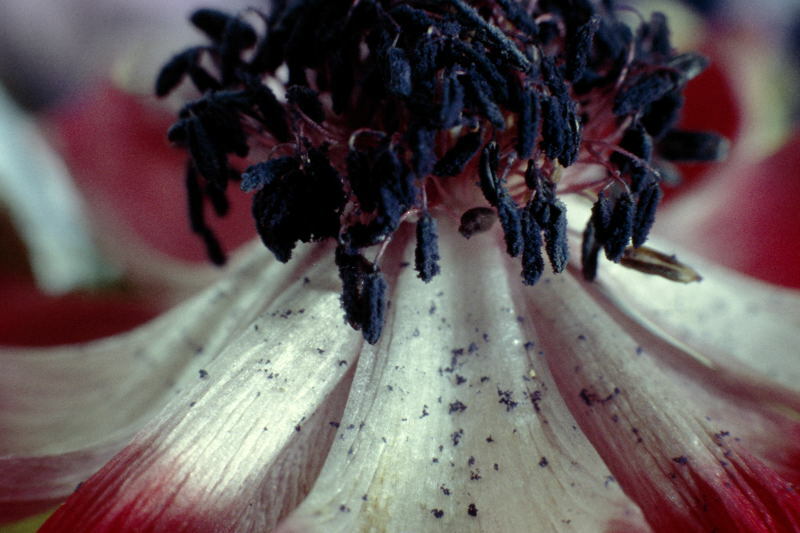 Anemones, going over and past their best, photographed in Bristol in the late 1970s. Although its over 30 years ago, I can still remember being attracted by the colours, and the fact that these blooms were starting to deteriorate. And I had a tripod, and time on my hands. The thoughts that I had about these images then are still with me now. To me, the upper photo is a portrait of a living being, with a dark hat or hair of feathers or something, and he/she/it is looking straight at me – confrontationally maybe. 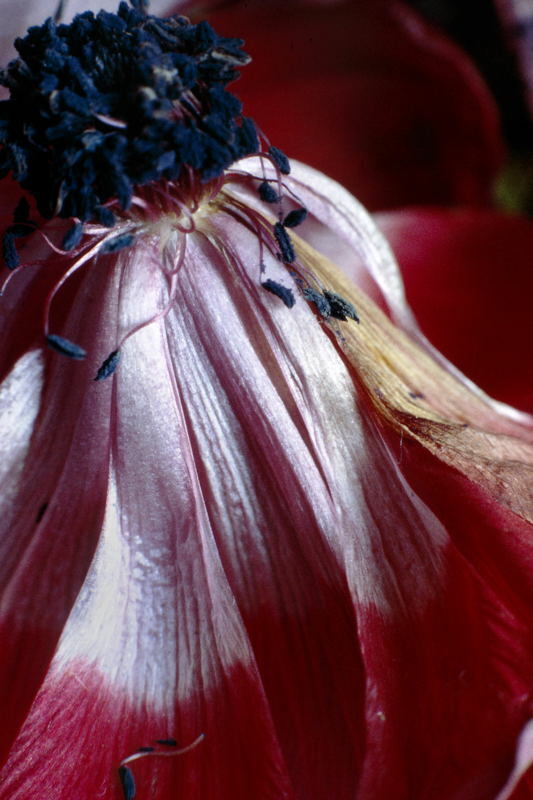 There is some falloff of focus at upper left in the lower shot, but what gets to me here are the sheens, textures and colours on the tumbling and convoluted surfaces of those dying petals. Tripod-mounted Olympus OM-1 with the ? 75-150 Zuiko? lens, plus extension tubes or close up lenses; Agfa CT18 colour slides, rated at 64 ISO to further saturate colour. All photos are my copyright and all rights are reserved.